. 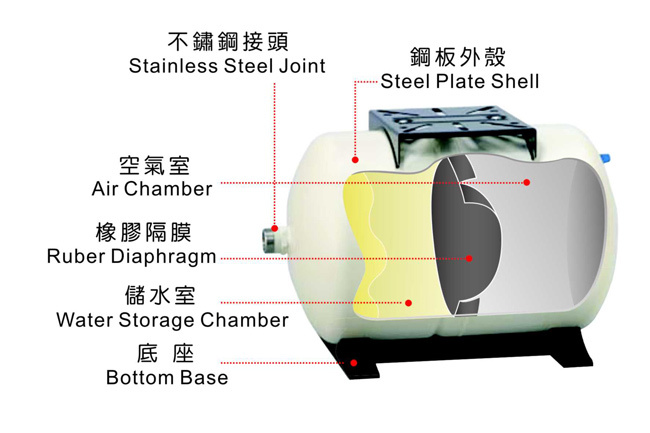 Diaphragm design pressure tank.The Inside construction is divided into air chamber and water storage chamber. 2. Assemble with EVERGUSH water pump,control panel,piping,valves,etc.All in one auto booster pump system. 3. Water Storage, to prevent from frequency on-off operation of pumps. 6. Liquid Temperature: Max. 75C.